Progressive Industries continues to raise the standard in RV protection innovation. The new Portable SSP-50XL offer impressive new features and several design features are “patent pending” for exclusivity of design and function. Operating Temperatures | -40°C to + 105°C. 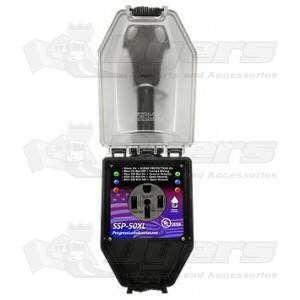 Surge Protection | 5-mode / 1650J / 45,000A. Higher Rated Wire (6) Awg. Lifetime Warranty (excludes weather receptacle shield). Product proudly made in the USA.